This example shows how to solve a coupled elasticity-electrostatics problem. Piezoelectric materials deform when a voltage is applied. Conversely, a voltage is produced when a piezoelectric material is deformed. 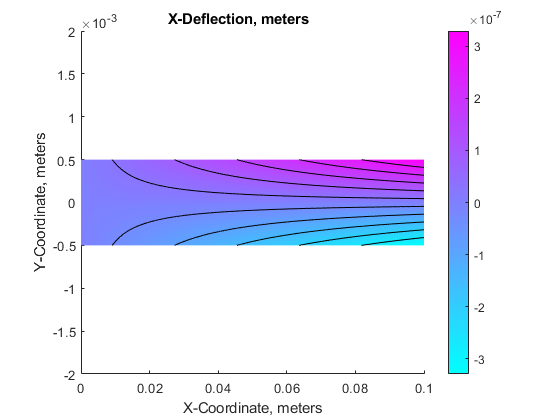 Analysis of a piezoelectric part requires the solution of a set of coupled partial differential equations with deflections and electrical potential as dependent variables. One of the main objectives of this example is to show how such a system of coupled partial differential equations can be solved using PDE Toolbox. In 2D, σ has the components σ11,σ22, and σ12=σ21 and D has the components D1 and D2. where Cij are the elastic coefficients, Ei are the electrical permittivities, and eij are the piezoelectric stress coefficients. The piezoelectric stress coefficients are written to conform to conventional notation in piezoelectric materials where the z-direction (3-direction) is aligned with the "poled" direction of the material. For the 2D analysis, we want the poled direction to be aligned with the y-axis. See reference 2, for example, for a more complete description of the piezoelectric equations. The strain-displacement equations and electric field equations above can be substituted into the constitutive equations to yield a system of equations for the stresses and electrical displacements in terms of displacement and electrical potential derivatives. If the resulting equations are substituted into the PDE system equations, we have a system of equations that involve the divergence of the displacement and electrical potential derivatives. Arranging these equations to match the form required by PDE Toolbox will be the topic for the next section. The documentation for the function assempde shows that it is convenient to view the tensor cijkl as an N×N matrix of 2×2 submatrices. The most convenient form for the c input argument for this symmetric, N=3 system has 21 rows in c and is described in detail in the PDE Toolbox documentation. It is repeated here for convenience. From this equation the traditional constitutive coefficients can be mapped to the form required for the PDE Toolbox c matrix. Note the minus sign in the equations for electric field. This minus must be incorporated into the c matrix to match the PDE Toolbox convention. This is shown explicitly below. Now that we have defined the equations for a 2D piezoelectric material, we are ready to apply these to a specific model. The model is a two-layer cantilever beam that has been extensively studied (e.g. refs 1 and 2). It is defined as a "bimorph" because although both layers are made of the same Polyvinylidene Fluoride (PVDF) material, in the top layer the polarization direction points down (minus y direction) and in the bottom layer, it points up. A schematic of the cantilever beam is shown in the figure below. This figure is not to scale; the actual thickness/length ratio is 100 so the beam is very slender. When a voltage is applied between the lower and upper surfaces of the beam, it deflects in the y-direction; one layer shortens and the other layer lengthens. Devices of this type can be designed to provide the required motion or force for different applications. The first step in solving a PDE problem is to create a PDE Model. This is a container that holds the number of equations, geometry, mesh, and boundary conditions for your PDE. The equations of linear elasticity have three components, so the number of equations in this model is three. The simple two-layer geometry of the beam can be created by defining the sum of two rectangles. The two lines below contain the columns of the geometry description matrix (GDM) for the two rectangular layers. The GDM is the first input argument to decsg and describes the basic geometric entities in the model. Create a geometry entity and append to the PDE model. The material in both layers of the beam is Polyvinylidene Fluoride (PVDF), a thermoplastic polymer with piezoelectric behavior. Specify relative electrical permittivity of the material at constant stress. Specify electrical permittivity of vacuum. 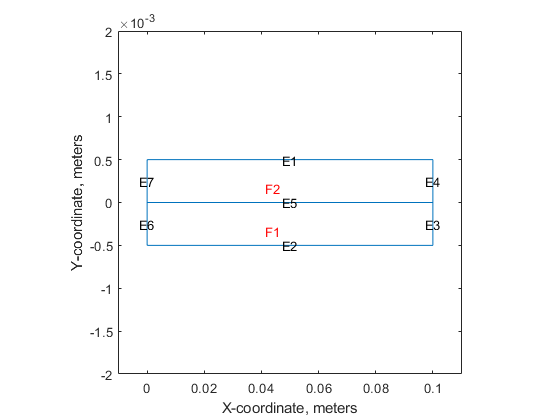 The piezoelectric strain coefficients for PVDF are given above but the constitutive relations in the finite element formulation require the piezoelectric stress coefficients. These are calculated on the next line (for details see, for example, reference 2). As discussed above, it is convenient to view the 21 coefficients required by assempde as a 3 x 3 array of 2 x 2 submatrices. The cij matrices defined below are the 2 x 2 submatrices in the upper triangle of this array. For this example, the top geometry edge (edge 1) has the voltage prescribed as 100 volts. The bottom geometry edge (edge 2) has the voltage prescribed as 0 volts (i.e. grounded). The left geometry edge (edges 6 and 7) have the u and v displacements equal zero (i.e. clamped). The stress and charge are zero on the right geometry edge (i.e. q = 0). Set the voltage (solution component 3) on the top edge to V.
Set the voltage (solution component 3) on the bottom edge to zero. Set the x and y displacements (solution components 1 and 2) on the left end (geometry edges 6 and 7) to zero. We need a relatively fine mesh to accurately model the bending of the beam. Extract the NodalSolution property from the result, this has the x-deflection in column 1, the y-deflection in column 2, and the electrical potential in column 3. Find the minimum y-deflection, and plot the solution components. A simple, approximate, analytical solution was obtained for this problem in reference 1. 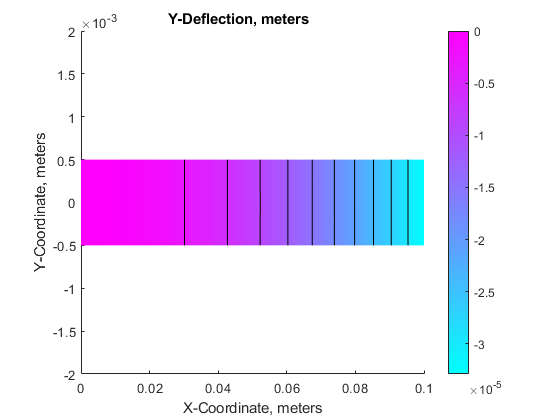 The color contour plots of x-deflection and y-deflection show the standard behavior of the classical cantilever beam solution. 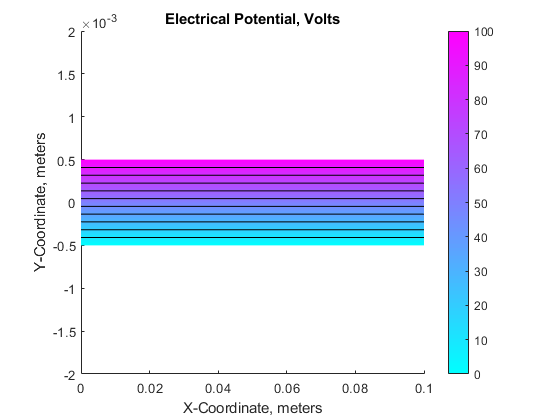 The linear distribution of voltage through the thickness of the beam is as expected. There is good agreement between the PDE Toolbox finite element solution and the analytical solution from reference 1. Although this example shows a very specific coupled elasticity-electrostatic model, the general approach here can be used for many other systems of coupled PDEs. The key to applying PDE Toolbox to these types of coupled systems is the systematic, multi-step coefficient mapping procedure described above. Hwang, W. S.; Park, H. C; Finite Element Modeling of Piezoelectric Sensors and Actuators. AIAA Journal, 31(5), pp 930-937, 1993. Pieford, V; Finite Element Modeling of Piezoelectric Active Structures. PhD Thesis, Universite Libre De Bruxelles, 2001.